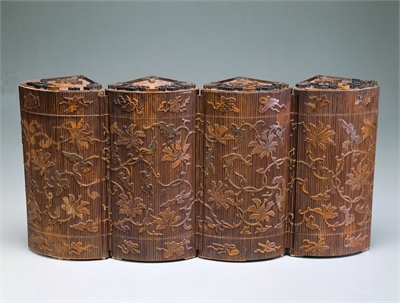 This round curio box has been joined by bamboo thread and a "chu-huang" bamboo veneer, carved with lotuses, applied to the outer surface. The ingenious design allows for the four fan-shaped quadrants of the body to be either spread out so that they stand end to end in a straight line, or for them to be turned around 360° so that they form a square display box. Each quadrant is divided into a number of compartments, one of which has a rotating stand with more sections. 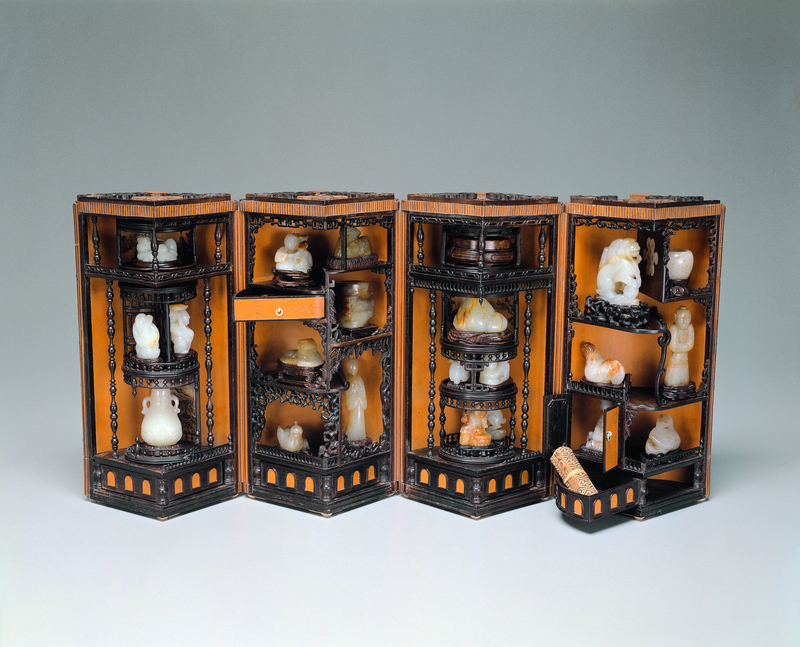 These compartments house a total of 27 individual curios, and in addition to ancient and Qing dynasty jades, there are also handscroll paintings and album leaves by artists working for the court of the Qianlong emperor (r. 1736-1795). 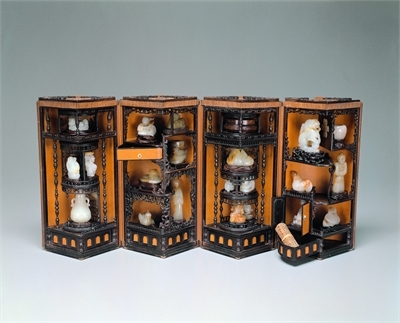 A triangular drawer in the lower section of the quadrants each contain a handscroll, but at the moment there are only three, with a landscape by Fang Zong, and two paintings of flowers, one by Yang Dazhang, and the other by Li Bing, each measuring only 7 cm in length. 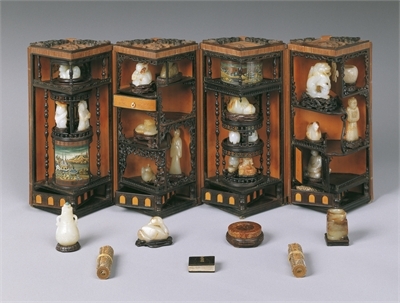 One of these triangular drawers also contains an album leaf figure painting by the artist Jin Tingbiao, measuring roughly 3 cm along each side. 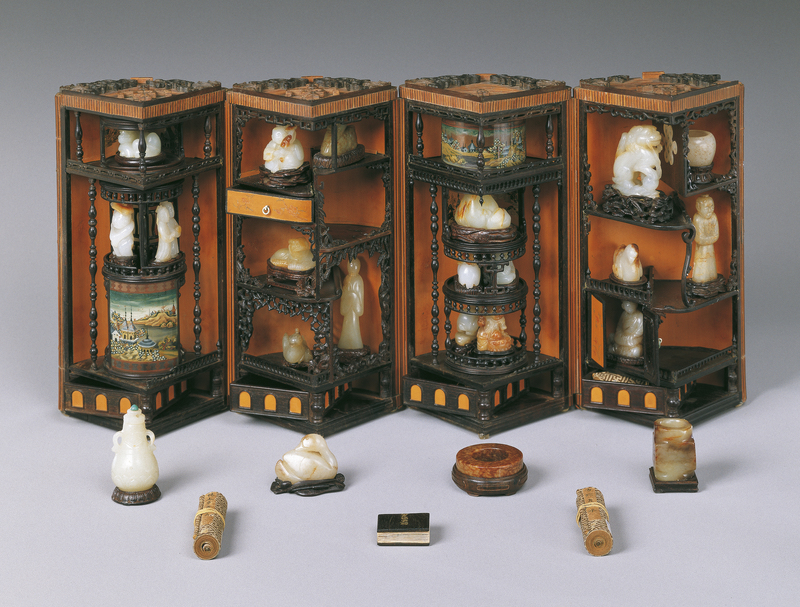 These paintings are the smallest examples of their type in the collection of the National Palace Museum.